I just re-discovered an awesome… performer? Internet personality? Cook? I’m not sure what to call him, exactly. He defies explanation. He is Charles Phoenix, and on his website he describes himself as a showman, author, humorist, and Ambassador of Americana, which seems as good a description as any. Isn’t that the best thing you’ve seen in years? I want to a Christmas party this year, just so that I can make Frosty the Cheeseball Man. If you have an hour to kill, I highly recommend looking through his other cooking videos. They’re pretty much the best. Let’s take a minute to share patterns that Mr. Phoenix would heartily approve of. Fun, kitschy, and a little bit weird. 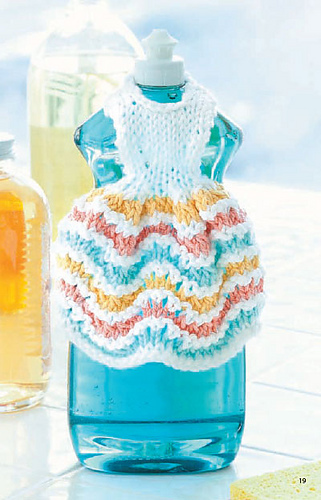 When I throw a party, I always insist on a strict dress code, even for my dish soap bottles. 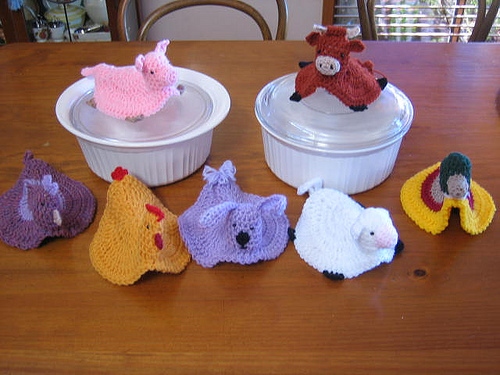 Why waste your time with boring old pot holders when you can use this adorable menagerie? This entry was posted in Inspiration and tagged americana, charles phoenix, dish cloth, frosty the cheeseball snowman, kitsch, kitschy, phoenix, pot holder, retro, sweater, tacky on November 10, 2014 by onemilljellybeans.